As I've mentioned elsewhere, I'm finding Michelle Garcia Winner's Social Thinking curriculum incredibly helpful for working with my higher functioning students on the spectrum. Some of these ideas are based on (or are straight out of) Social Thinking; others are things I've collected here and there. Most are for a dyad or group, though many could also be used in individual sessions. Perspective Drawings - Have the kids draw something from someone else's perspective (this Gary Larson cartoon gave me this idea). How would an ant see your shoe or a toy on the playground? How might a bird see the same thing? You could also simply have them draw how another person would see something, but I don't think that's quite as fun. Finish the Squiggle - Draw a squiggle on a piece of paper and make copies for everyone. Ask them to complete the picture. Everyone usually sees a different possibility within the same squiggle..
Perspective Glasses - Another idea I spotted on Pinterest and adapted. Have the kids draw how others see them. Or have them draw their own, then switch glasses with someone else and pretend to be that person. There are really a lot of possibilities here. Back-to-Back Drawing - Students sit back to back. One student describes a picture he is drawing, and the other has to try and replicate it on his own paper just by following the verbal instructions. Requires the first kid to recognize that the second one doesn't know anything about the picture other than what he tells him. Headbandz - Either the store-bought game or your own version. The basic premise is that each player wears a headband with an index card on the front. The card has the name of a well-known character on it. All of the players can see everyone else's card but they cannot see their own. By asking yes or no questions, students have to figure out who they are. A variation by Michelle Garcia WInner has you wearing a headband with a photo on it. The photo comes from a set that has several similar photos. The child has to describe the picture to you. Then you remove the photo (without looking at it), shuffle it in with the rest of the pictures, and try to guess which one the child was describing. This helps you see how much the child recognized that you could not see what he saw, and whether he was able to give you enough information for you to pick out the correct picture. Read Interrupting Chicken by David Ezra Stein - How does the dad feels when his daughter keeps interrupting while he's trying to read her a bedtime story? Similarly, you can read Chester by Melanie Watt. How is Chester a "thinking about me" kind of cat, instead of a "thinking of you" cat? I made a worksheet to go with it here. Friendship Bugs - This is from the Creative Elementary School Counselor blog. You can either have the kids make bugs listing Things I Do that Bug Others or Things Others Do that Bug Me. Or maybe one of each! ﻿Perspective Mapping﻿ - Laminate this page or put it in a plastic page protector. 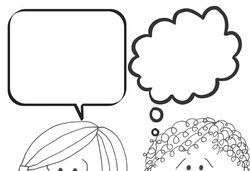 With a dry-erase marker, write in the speech bubble (or have the child write) something they said to someone else that was maybe thoughtless or hurtful or rude. Then have them think about what sorts of things the other person might have been thinking, and write those in the thought bubble. Erase and do it again, but this time writing something more appropriate or kind in the speech bubble. Will the other person's thoughts change? Discuss. Feelings Charades - Frankly, I'm kind of sick of this old standby, but it's not old to the kids. Have one student draw a feelings word out of a hat and act it out while the others guess what the feeling word is. You can ask them about times they've had that feeling, or what they would say to someone who looked like they felt that way. Silent Greetings - Students in a group have to walk around and silently greet each other in as many ways as possible (waving big or with just a finger, smiling, shaking hands, giving a high five, hugging, bowing, nodding their heads, etc.). You can add an element of fun by adding different types of music to accompany the activity. Discuss in what situations each of these would be an appropriate greeting. You can combine this with a discussion about personal space, and the variations between intimate, personal, social, and public space that are determined by the setting and relationships of those present. Create a Board Game - Kids have to work together on a complex project that requires cooperation, flexibility, and a lot of executive functioning skills. If you want the final product to be extra awesome, order a blank game board from www.barebooks.com. Otherwise, just make it on a poster board. You can laminate it for durability when it's complete. I think a board game about Superflex would be a lot of fun for kids to make. I'm going to try that after we've worked with the materials for awhile. Make Your Own Comic Book - Same advantages as above. Bare Books also sells blank comic books that are quite inexpensive, and you can even get them in a kit that comes with speech bubble templates and a how-to book. You could use this as an individual activity as well. Maybe they could create new villains for Superflex to defeat! One Change - Tell the kids they are going to be detectives and they're going to have to be very observant in order to solve a mystery. They will have to think with their eyes. Stand in front of the room and have them study your appearance: what you're wearing, your jewelry, your hairstyle, etc. Then go out into the hall and change one thing (difficult ones are to take off your earrings or put your shoes on the wrong feet; easier ones are to roll up your pant legs or put on a fake mustache or a goofy hat). When you come back in, tell them to raise their hand when they see what looks different---you may be surprised at who has a lot of difficulty with this. Let everyone have a turn to change something. Art Mirror - Have two kids sit across from each other. While one draws a picture, the other tries to copy it as accurately as possible onto her own paper. Pass a Feeling - Sit with students in a circle, with everyone having serious faces. Say you're going to pass a feeling around the circle. Smile at the student next to you, then have that student smile at the next, and so on around the circle. Do the same with a frown, a silly face. or a surprised look, but make it more challenging by passing the feeling in a more random order. Students need to be watching each other to catch the feeling. Comic Strip Challenge - FInd some comic strips to copy (4-panel or the larger Sunday paper ones, depending on the skill level of your group). I love Calvin and Hobbes because the characters so often have great facial expressions. Blank out the words in the speech and thought bubbles. 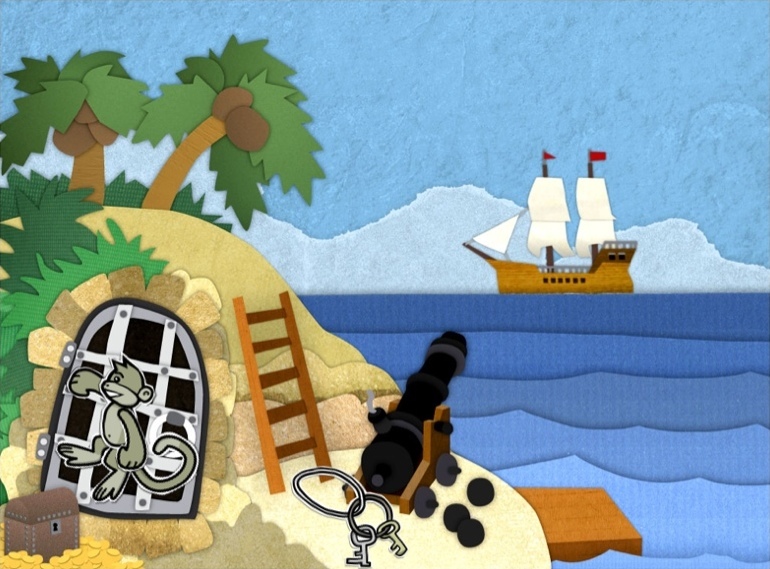 Challenge kids to look at the pictures and try and figure out what the characters are saying or thinking. Have them fill in the bubbles, then read the cartoons to each other. Eye Spy Game - Start by reminding students that eyes are like pointers that show what someone is thinking about. Choose something in the room to look at, and tell them they have to guess what you're thinking of. At first I choose something fairly close, then work up to things that are farther away. Let them have a turn being the "looker." Tell students that this is why we look at others when we're talking or listening to them--it shows them that we are thinking about them. For students who have great difficulty with this you can add a hint: cut out a "thought bubble" and glue to a popsicle stick. Use a small bit of velcro to attach a clue about the thing you're thinking about (I use small squares of colored paper to show them what color the object is). Repeat Pete - I bought this as a board game, but I only use the cards from it. Each card has an action or phrase on it. The first person chooses a card and acts out what it says. The second person chooses a card and acts out the first person's action, then his own. The third person chooses a card and has to act out the previous two actions then add hers. And so on. This requires paying attention to what others are doing as well as remembering the chain of actions. Kids LOVE this game. You can make your own cards, and the sillier the better. Our faves from the game I bought include "play air guitar" "flap arms and say, 'I can fly!'" "act and sound like a monkey," "march in place," "yodel," "say, 'I'm beautiful!'" You get the idea. Intro to Topic - To introduce the concept of expected and unexpected behaviors, Michelle Garcia Winner suggests coming into the room and doing something unusual (like standing on a chair or draping your body across a desk) while acting like everything is perfectly normal. After a minute or two, you can ask students if any of them are having a thought. How do they feel about you doing something unexpected? This can lead into a conversation about how when we do something that others don't expect, it causes them to have (usually uncomfortable or weird) thoughts and feelings about us. Car Wash - Complimenting others can make them have friendly feelings about us, but coming up with meaningful compliments takes practice. We work on this by periodically ending group with a "Car Wash." Students form two lines facing each other and move their hands around like they are washing a car ("wax on, wax off," ha ha)(that's a Karate Kid reference for those of you under 50). One student passes through the car wash, stopping in front of each washer to receive a meaningful compliment (obviously, I have to model this a lot at the beginning). At the end, she emerges all clean, shiny, and feeling good. Only "wash" one or two kids each time so it feels special. Newspaper Dancing - Another Pinterest idea from a music teacher to help kids work on personal space. Spread out one sheet of newspaper per child on the floor, turn on some jams, and tell them they have to stay on their newspaper page while they're dancing. Fold the paper in half, and repeat. Sounds like a Friday afternoon activity to me! I found a really helpful website where an autism expert named Joel Shaul shares a variety of activities I'm using, many of which are free! I made one of his activities into a worksheet I can use with small groups. I think it would also be excellent for use with some of my impulsive or unregulated kids who aren't on the spectrum. You could use this activity in conjunction with a discussion about Thought Bubbles as well. Related to the concepts of expected and unexpected behaviors is the idea that problems come in different sizes. It's related because if we have a huge upset reaction to a tiny problem, that's unexpected. Click here for a printable worksheet about the size of the problem. And here I wrote a post about a fun Size of the Problem/Size of Reaction classroom lesson that would work well (probably better) with a small group. Bug in a Rug - This is good for a group of 4-6 kids (or more, if they're quite high functioning). Have the group sit in a circle on the floor. Everybody looks around the circle to notice who is sitting where. Designate one person as "It." Have her step out of the room. Choose one of the remaining kids to sit in the middle of the circle, then place a blanket over her. Everyone else stays exactly where they were (again, unless it's a higher-functioning group, in which case they should adjust themselves to fill the gap in the circle to make it more challenging). "It" returns to the room and has to figure out who is under the blanket. To up the ante even more, have two kids hide under the blanket. At the end, I usually send the teacher out and have ALL the kids try and fit under the blanket. This cracks them up because they feel so sneaky! Bodyguard - This is a game for a larger group that involves teamwork and some nonverbal communication. Students form a large circle; they are the paparazzi (you'll probably have to explain what that means). Two players go into the center. One is the VIP, and the other is the bodyguard. With a large ball like a beach ball, the paparazzi try to hit the VIP while the bodyguard tries to protect him. Help the paparazzi notice that if they work together (e.g., keep the ball moving quickly, signal each other with their eyes when they're going to throw it to someone), they have a better chance of hitting the VIP. Once the ball touches the VIP, he moves to the circle to be a paparazzi and the bodyguard becomes the next VIP. Make sure everyone gets to play both roles. Pink Panther - This is a self-control game. Students sit at their desks and put on a serious face. One student is the Pink Panther. He goes around and tries to get the other students to laugh or smile. He can make faces, tell jokes, dance, or do anything he wants (that's appropriate, of course) except touch them. Once someone smiles or laughs, they join the Pink Panther in trying to get the other kids to smile. Whoever is the last to lose it is the next Pink Panther.